We have custom sports mugs too! 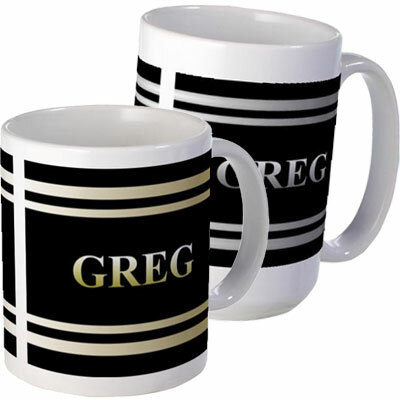 Large and small ceramic coffee mugs with metallic gold or silver text printed on a black background. To order, email the name you would like printed on the mug and say whether it should be in silver or gold metallic text. and be sure to include design order number MTL2 since we also have other mug designs available.Your personalized mug will be ready to buy online within 24 hrs. See bottom of page for pricing. It's easy, contact personalizedbyu@gmx.com.com Quote design order No. MTL2 with your color preference and mug size along with the name you would like printed on the mug. It will be ready for you to buy online within 24 hrs.